Yes. He sleeps with a blanket near his head. Yes. He can breathe. His face isn’t covered. Don’t report me to DHR. Ermahgawd, I did it. I can’t believe that I seriously tiptoed into my son’s room last night… and slept on the floor next to his crib, because … I missed him. What the? I don’t understand how someone can miss someone sleeping in the next room. Especially when that sleeping “angel” spends most of his day screaming at the top of his lungs, finding sharp objects, playing bongos on the dogs backs, throwing door mats (that’s a new one) and trying to nose dive off the couch. I work Wednesday-Sunday. During the week I go to work at 3:45 am…on the weekends I am at work by 3 am. I always put my son down for bed, but I am never there when he wakes up. I wouldn’t change my schedule even if I could. If I have to work…then working half of my day while he’s still asleep is ideal. When I get home from work between 11-1 he’s usually ready for his nap. We nap at the same time and then we have the rest of the day to play. Mondays and Tuesdays are our days. We go to story time at the library. We go to Target. We go to lunch together. We play outside. We drive around. We feed the fish. We go to the park. We pet the horses. We practice our manners (hey, at least I try). We do a lot. I cram as many activities into those two days. They are my favorite days of the week. When Wednesday rolls around…I’m back to work again. And, I miss him. I become that creepy mom that peeps on him while he sleeps. 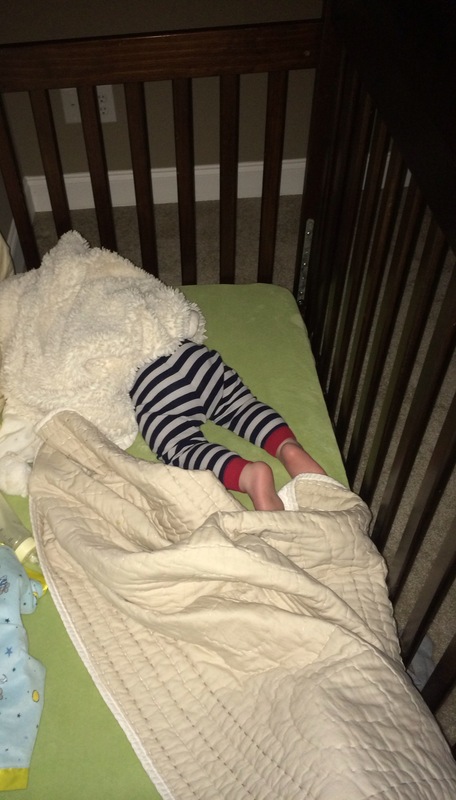 And, I guess sometimes sleeps next to his crib. What a weirdo. That monster owns me.